In Texas, water rights depend on whether the water is groundwater or surface water. Generally, Texas groundwater belongs to the landowner. Groundwater is governed by the rule of capture, which grants landowners the right to capture the water beneath their property. The landowners do not own the water but have a right only to pump and capture whatever water is available, regardless of the effects of that pumping on neighboring wells. Water found below the earth's surface in the crevices of soil and rocks is called percolating water, or more commonly groundwater. Texas groundwater law is judge-made law, derived from the English common law rule of "absolute ownership." Groundwater belongs to the owners of the land above it and may be used or sold as private property. Texas courts have adopted, and the legislature has not modified, the common law rule that a landowner has a right to take for use or sale all the water that he can capture from below his land. Because of the seemingly absolute nature of this right, Texas water law has often been called the "law of the biggest pump." Texas courts have consistently ruled that a landowner has a right to pump all the water that he can from beneath his land regardless of the effect on wells of adjacent owners. The legal presumption in Texas is that all sources of groundwater are percolating waters as opposed to subterranean rivers. Consequently, the landowner is presumed to own underground water until it is conclusively shown that the the source of supply is a subterranean river. The state of the law with respect to ownership of subterranean rivers is not settled in Texas. Both stream underflow and subterranean rivers have been expressly excluded from the definition of underground water in Section 52.001 of the Texas Water Code. The practical effect of Texas groundwater law is that one landowner can dry up an adjoining landowner's well and the landowner with the dry well is without a legal remedy. Texas courts have refused to adopt the American rule of "reasonable use" with respect to groundwater. * If an adjoining neighbor trespasses on the land to remove water either by drilling a well directly on the landowner's property or by drilling a "slant" well on adjoining property so that it crosses the subterranean property line, the injured landowner can sue for trespass. * There is malicious or wanton conduct in pumping water for the sole purpose of injuring an adjoining landowner. * Landowners waste artesian well water by allowing it to run off their land or to percolate back into the water table. * There is contamination of water in a landowner's well. No one is allowed to unlawfully pollute groundwater. * Land subsidence and surface injury result from negligent overpumping from adjoining lands. Limited Regulation of Groundwater. The Texas Legislature acknowledged private ownership of percolating groundwater in legislation passed in 1949 and again in 1985, when it authorized the establishment of underground water conservation districts. These districts generally have the authority to promulgate rules for conserving, protecting, recharging, and preventing waste of underground water. Texas water law has evolved from conflicts between competing legal systems and from the necessity of developing a system that fits the needs of Texas. Water law will continue to evolve as the conditions of society, politics, populations, and economics changes. Two legal doctrines of surface water law are recognized in Texas today-the riparian doctrine and the prior appropriation doctrine. Riparian Doctrine. The riparian doctrine is based on English common law. These court-developed rules are used in deciding cases that involve water use conflicts. 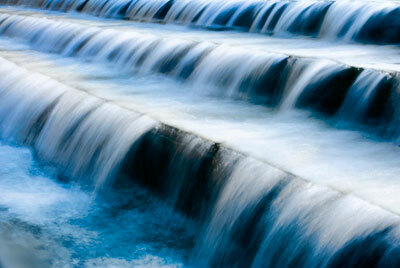 The basic concept is that private water rights are tied to the ownership of land bordering a natural river or stream. Thus, water rights are controlled by land ownership. Riparian landowners have a right to use the water, provided that the use is reasonable in relation to the needs of all other riparian owners. Riparian owners retain the right to use water so long as they own the land adjacent to the water. Prior Appropriation Doctrine. This doctrine, on the other hand, is controlled by statute. Applied in the western states, prior appropriation is not related to land ownership; instead water rights are acquired by compliance with statutory requirements. While the principles of riparian rights were appropriate in areas of England and the United States where rainfall averages 30 inches or more a year, these rights were not suited to the arid West. During their early development, western states failed to control rivers and streams, and water was treated as though it belonged to no one. In the absence of any rules, people simply took water from streams and used it; that is, they appropriated it. When this practice became legalized, it became known as the Doctrine of Prior Appropriation. In 1967 the Texas Legislature merged the riparian rights system into the prior appropriation system with passage of the Water Rights Adjudication Act. The act required any person claiming a riparian water right to file a claim for the right by 1969 with the Texas Water Commission. With passage of the 1967 act, Texas consolidated the allocation of surface water into a unified water permit system. Anyone wishing to use surface water (exclusive of drainage water) must receive permission from the state in the form of a "water right." Awarding permits for these "water rights" is a task of the Texas Commission on Environmental Quality. Diffused surface water, in its natural state, occurs after rainfall or snowmelt and flows across land from high elevations to lower elevations. This diffused water is often called stormwater, drainage water or surface runoff. Once the water flows into a clearly defined watercourse, it is claimed by the state and is subject to appropriation. On its way to the watercourse, drainage water often flows across privately owned lands. In such cases the water does not automatically become the property of the landowners, although they may capture and use it. Legal problems arise when a landowner interferes with the natural flow of drainage water by capturing and holding the flow or by diverting or increasing it. There are three general rules of law that apply when diffused surface water is captured or diverted. Common Enemy Rule. One is called the "common enemy rule." Under this rule, drainage water is regarded as an enemy common to all landowners. The law allows every owner to take any measure to protect property, regardless of the consequences to other neighbors. Natural Flow or Civil Law Rule. This rule recognizes that each landowner is entitled to rely upon continuation of the natural flow. Under this rule a landowner who increases runoff, thereby causing flooding, is liable for damages. What rights do landowners have to use groundwater? From an ownership perspective, Texas groundwater law is simple and straightforward: Groundwater is the private property of the owner of the overlying land. The owners of the land have the right to capture the groundwater beneath their land. However, the adjoining landowners have the same right to pump water from beneath their properties. Pumping water sometimes causes the groundwater beneath one property to move to an adjoining property and cause the nearby landowner's wells to go dry. The rule of capture was adopted by the Texas Supreme Court in 1904 in Houston & T.C. Ry. Co. v East, 81 S.W. 279 (Texas 1904). This rule allows landowners to pump as much water as they chose, without liability to surrounding landowners who might claim that the pumping has depleted their wells. The rule of capture has been followed by the courts ever since that 1904 decision. Texas groundwater law has often been called the "law of the biggest pump." This means that the deepest pump gets the water and the shallower well goes dry. What is the latest word from the Supreme court on the rule of capture? Some 95 years after the East decision, the Texas Supreme court reviewed the rule in Sipriano v. Great Spring Waters of America, et al., 1 SW3d 75 (Texas 1999) [Ozarka]. The Ozarka case involved a claim by a domestic well owner that Ozarka's nearby pumping had dried up his well. The landowner asked the court to protect his private-property interest in groundwater by imposing liability on Ozarka. Many observers thought that the Texas Supreme court would modify the capture rule to protect rural homeowners and domestic users of water. They were wrong. The court unanimously affirmed the rule of capture. However, it suggested that it might change the rule in the future if the Texas Legislature did not adequately address groundwater overpumping. The Legislature's response was to strengthen the laws enabling citizens to manage this problem locally through groundwater conservation districts. Reproduced with permission from the July 2005 issue of Texas Parks & Wildlife magazine.